That's probably why it's on Steam now. 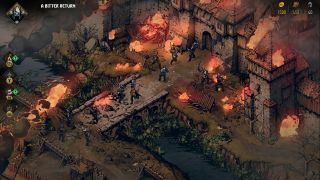 Thronebreaker: The Witcher Tales, despite our very positive review, has not been the success that CD Projekt Red expected, according to a recent CDPR earnings call. It’s one of our highest review scores of 2018, but the initial GOG exclusivity may have cost it some early sales. CEO Adam Kiciński told investors, “The game appealed to the community, which drove up our expectations regarding sales. Unfortunately, as yet, these expectations have not been fulfilled.” Kiciński said he remained optimistic, however, and expects CDPR will sell Thronebreaker for many years, despite the slow start. CDPR hopes that the upcoming console release will help sales, and despite the original GOG exclusivity, Thronebreaker appeared on Steam this week. While some small games can carve out a niche outside of Steam and titans like Battlefield V don’t need the platform, Thronebreaker sits somewhere in the middle, part of a popular series but not a huge deal on its own. Games that exist in this very broad area are still very dependent on Valve’s imposing store. He added that a Steam release had always been “considered”, though otherwise kept CDPR’s decision-making process under wraps.